Performance Time: Approximately 90-120 minutes, 75 pgs. MUSICAL. On a dark and stormy night, a troupe of Commedia dell’Arte actors arrive at a house looking to escape the storm and to get a bit of food and rest. A maid informs the troupe that they have arrived at the home of the ruler of Venice on the eve of his daughter’s wedding. The daughter is melancholy at the thought of marrying a man she does not love, so the troupe attempts to raise her sprits by performing the story of Pinocchio. Carved by a poor woodcarver, Pinocchio, a wooden puppet, yearns to be a real boy, but he makes several mistakes as he journeys into boyhood. Along the way, he meets up with a cricket, the Blue Fairy, a puppeteer, a sly fox and cat, a boy who plays hooky from school, and the five green fishermen. 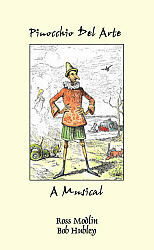 Though liberties have been taken to accommodate the Commedia portion of this musical, much of the Pinocchio storyline follows that of the 1883 original story by Carlo Collodi.